I haven't been keeping up with painting my nails lately, but today I decided I would paint my nails on one of my study breaks. 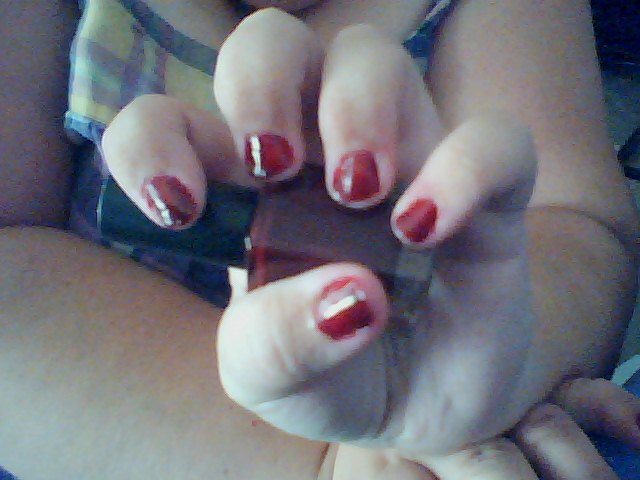 I decided to go with an ox blood color, simply because it reminds me of cranberry sauce. The color Style Icon is a beautiful polish created by a company called Color Club. In the last couple of months or so, I've received Birchboxes(monthly subscription to get deluxe samples to try new things) with a couple of Color Club's mini nail polishes. I loved the formula and the colors so much that I decided to splurge and buy this one on Hautelook.com. Its a buildable formula, so even one coat gives an opaque, but light, color which darkens with additional coats. I love the fact that you can have a range of colors with just one nail polish. The polish lasts at least 3 days without chipping with a base and top coat. I will be definitely buying more of these nail polishes in the future, but right now I have plenty to last awhile. FTC: I purchased the mentioned products with my own money and these are my own opinions.